Winter tires boast specific features designed to plow through a variety of challenges. Flexible tread rubber ensures that the tire is able to grip the road with ease. The deeper tread depth is engineered to reduce snow buildup on the tires and improve traction on the road while the biting edges improve grip on icy streets. 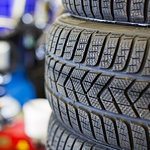 The attentive and professional associates at Korum Automotive Group can ensure that your vehicle is equipped with the tires best suited to handle the current road and weather conditions. We welcome the opportunity to serve you and all of your automotive needs today!